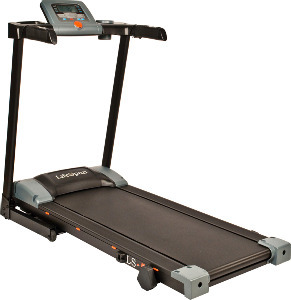 The budged priced Lifespan LS-5T folding treadmill is a basic model for lightweight and infrequent walkers. The 4.3" by 1.7" LCD display has five window readouts for speed, time, distance, calories, laps, and heart rate. It has five speed control programs, each with three levels. UPDATE: The LS-5T treadmill has been discontinued. Check out the popular Lifespan TR1200i for a comparable model. It has won numerous Best Buy Awards. The Lifespan LS-5T folding treadmill has a decent size 1.5 hp continuous duty motor, 1.7-inch roller, a top belt speed of 7.5 mph, and contact HR sensors on the handlebars. The manual incline has three levels — flat, 2%, and 4-5% — but it is not as impressive as it sounds. Rather than use a latch mechanism and manual lifting up the front of the deck, this model uses a small knob at the rear of the deck to dial the elevation up and down. However, the change is very slight. Users who have posted reviews say that the Lifespan LS-5T is easy to put together in about 15 minutes since it comes partially assembled. It is lightweight and quick to fold up and store out of the way. It is narrow with just a 16" wide tread belt but that can be a plus since the handlebars with the contact HR grips are closer to your body. On the other hand, if you like to swing your arms naturally when you walk and not hang on, you will hit your hands on the handlebars. The folding treadmill needs to be lubricated on a regular maintenance schedule to prevent friction and noise coming from the belt/deck, and the motor has a loud hum. This $499 compact Lifespan treadmill doesn’t shake when you walk on it, but it is advisable that it be used by only lightweight walkers. The LS 5-T is not a running treadmill, nor should it be used by anyone over 170 lbs (a guess) since it weighs only 97 pounds itself. The smallish display is hard to read and the warranty is only for 90 days so you might think about opting to buy a warranty to cover the motor and parts for an additional 3 years. The Lifespan LS-5T folding treadmill is an okay model, definitely better than a Weslo, but we would get the $499 Horizon Evolve SG over this one. If you really like the LS-5T, wait until it goes on sale for $349.